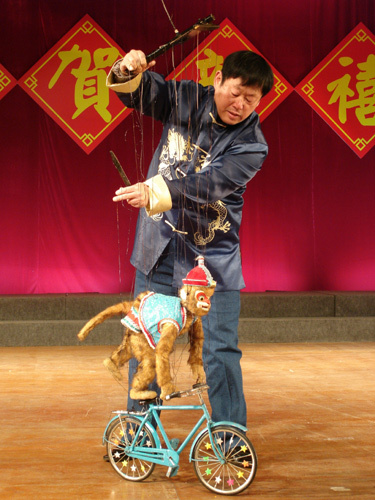 QUANZHOU, Fujian - Puppet master Lin Wenrong has the world on a string. Yet despite his 50 years of performing experience, he still has to use meditation to calm himself before he steps onto the stage. It is the nature of the act that makes absolute concentration so necessary. "I have to stay totally focused because even the tiniest mistake could ruin the entire performance," Lin said. A typical show lasting 10 minutes involves manipulating up to 36 strings to have a 70-centimeter puppet walk, dance, ride a bike or even play the guitar. "The more strings it has, the more a puppet can move in a lifelike manner, but the more skill-demanding it is for the performer," said the 63-year-old master from Quanzhou, Fujian province. "It's just like playing the piano. There is no shortcut for doing it perfectly, just years of hard training." String puppets first appeared in the Han Dynasty (202 BC-AD 220) and thrived in the Tang Dynasty (618-907). Lin learned the skill from the late legendary string puppet master Huang Yique, also known as the pioneer of China's modern string puppet. Lin remembers when he was still an apprentice. "It was normal to get beaten or yelled at when I first started learning," Lin recalled. "It sounds like torture, but that is the way of getting a hand on string puppets." For centuries, puppet shows enticed audiences with a complexity and accuracy comparable to computer programming, as well as tension and excellence comparable to gymnastics. "Once you get your fingers on a string puppet, you get connected for the rest of your life," Lin said. Quanzhou, the cradle and capital of the ancient art, has retained an archive of more than 700 plays with themes ranging from history to mystery. "It is indeed quite a legacy left behind by our ancestors," Lin said. "Speaking from my decades of performing experience, I know how difficult it is to create a new move or a new play." Thanks to its popularity, Lin said, his string puppet troupe can still make a decent living on box office sales, though life was hard during the "cultural revolution" (1966-76). "Our props were burned and many left the troupe," Lin recalled. "To keep the flame of string puppetry burning, we rehearsed some of the 'model operas', the only performances allowed at the time. We also tried to include other artistic forms to give them a chance to survive." When China started to reform and open up in the late 1970s, Lin and his master decided to put the show on a bigger stage. Their first international debut at the 1988 World Puppetry Festival in Nagoya was an overnight success. Lin has since toured many countries, wowing audiences across the world with his stunningly nimble acts. Apprentices, especially from Taiwan province where string puppets are also popular, have arrived one after another. In 1990, Lee Tien-ru, a puppet master who enjoys as much popularity in Taiwan as Huang did on the mainland, sent his two sons to Quanzhou to acknowledge Huang as their master. Sixteen years later, history repeated itself when Hsueh Ying-yuan, head of another Taiwan puppet theatre, became a follower of Lin, who took over the reins as the most senior performer after Huang's death in 2007. Lin insists on training his apprentices free of charge because most string puppet performers don't earn much nowadays. "That's a problem in our industry," Lin said. "But I believe the art will survive, as it has done so far."